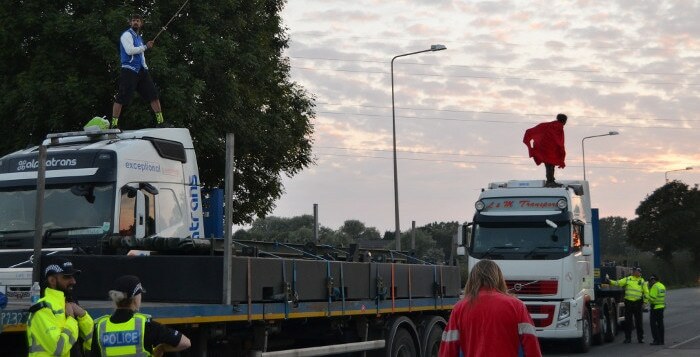 We’re shocked and saddened to see four anti-frackers given jail sentences for their truck protest against Cuadrilla’s frack site during the Rolling Resistance month of action in July 2017. The sentencing proceedings began on 25 September 2018 (covered by The Guardian, and Drill or Drop). Roscoe Blevins, 26 and Richard Roberts, 36 received 16 months immediate custodial sentences. Richard Loizou, 31 received 15 months immediate custodial sentences. They can expect to serve half of this time in jail. The rest on licence. Julian Brock, 47 received 12 months suspended custodial sentence.